This video will show you how different basement finishing materials react in the event of a basement flood, leak, a water accident, or just by being exposed to typical basement humidity. Larry Janesky, owner and president of Total Basement Finishing and Dr. Energy Saver, recently conducted this experiment to compare how these different basement walls and flooring solutions behave when exposed to moisture. Typical wood decking under carpet or regular laminate. A basement subfloor product sold in hardware stores consisting on a chip-board with a dimpled plastic mat on the bottom. The ThermalDry Insulated Floor Decking, developed by Total Basement Finishing, which is an inorganic magnesium oxide board insulated with rigid foam insulation. The MillCreek Basement Flooring, also available through the Total Basement Finishing network, which is a 100% waterproof, inorganic flooring option that mimics hardwood floors and can be installed straight against the slab without a subfloor. Metal studs, fiberglass insulation, water and mold-resistant drywall, and a pre-primed wood baseboard. Total Basement Finishing EverLast Wall panel, which is vinyl-finished cement board insulated with rigid foam, and a PVC baseboard. Total Basement Finishing Smart Wall System, which is a variation of the EverLast system, consisting of continuous rigid foam board insulation installed against the wall, with attached metal studs over the foam board, to hang a vinyl-finished cement board, and a PVC baseboard. The time-lapse video shows how these different assemblies perform in contact with water, in terms of water absorption and mold growth. 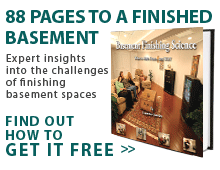 Total Basement Finishing products clearly outperform all the typical assemblies because they were specifically developed for basements by the world's authority in basement environment specialization. Call or visit our website to learn more about our products or to schedule a Free Design Consultation.